It is with some reluctance that I put these images on my blog. The Victrix figures are quite nice but the effort of glueing them together was onerous. I had gone over them removing mold lines before they were sprayed, but when I started to paint them there were still multiple pieces of flash and what was more troublesome there was significant defects in the castings. In some areas, it looked like someone had taken a blowtorch to the figures. I wonder now if I had got an early box of figures, if I remember correctly Victrix had some production problems early on with the French Infantry box, I wonder if the box I received was reflective of this, as I had pre-ordered them. I find it hard to reconcile these figures with the descriptions of others. Additionally, these were the last figures I had painted of the box of Victrix French (around 60 figures) and I was getting pretty tired of them by now. Notwithstanding this, I had taken the photos, so I will post them. My technique definitely can be improved and any suggestions would be welcomed. Please remember though that I am interested in painting units, rather then a figures and am not a modeler. A nice unit of figures is my goal in as few as painting steps as possible. I feel a white primer with a wash is an effective way to quickly paint figures so they have somewhat of a layered look with a single step. I usually paint 12 figures at a time, glueing them to a painting stick and then spraying them with an automotive white primer. Although the French uniforms I have seen in museums are quite dark, I feel that on campaign they would have faded quite a bit so I like a blue-grey colour to give the infantrymen a lighter blue. Here I used an very thinned down GW Shadow-Grey as a base coat for the jacket. The GW wash is too blue I find. I try to be neat, it is ok to go over on an area that is going to be painted with an minimally thinned acrylic paint, but if the adjacent area is going to be painted with a wash any areas would have to be repainted with white before I applied the wash. I apply the wash and roll the figure to let the thin liquid settle into the crevasses. I then wash the flesh areas with a GW Ogryn Flesh. I find this wash is excellent and as far as I am concerned the flesh area are done now in one step. 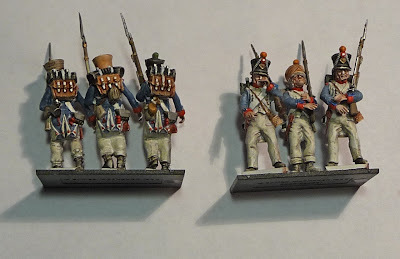 I then paint the shakos with a thinned GW Badab Black and the shako covers with GW Devlan Mud or GW Gryphonne Sepia. I do add a second full strength black wash to the shakos, but this time avoiding the shako chords. I also paint the metal parts with the the black as a base for the metal paints and the boots of course. I then reverse the figures and use the same 3 washes on the shakos, the ammunition pouch and the water bottles. I also paint the hair with the flesh wash. Sometimes, a second wash is required as the first coat does not give a dense enough colour. I am pretty well finished with the washes now. I then use a 3/4 thinned GW Blood Red on the collars, cuffs, the thing that hangs next to the ammunition pouch and the buttons. The figures are then again reversed and 3/4 thinned acrylic paints are applied to the rifle (Khemri Brown), the water bottle strap (Calthan Brown), bayonet sheath (GW Terracotta), rifle barrel, bayonet and shako straps (GW Boltgun Metal) and finally the cuff flaps (GW Enchanted Blue). I then start to repair the white, fixing the edges and the straps and applying some white to shakos. The figures are reversed the whites areas are repaired and the pre-painted knapsacks are glued in place. I use the GW black and sepia washes on the knapsack and the blanket roll. Once glued in place I touch up the knapsacks and the metal work and sacks with various colours. I also start to apply a brass paint to the musket and the buckles on the straps. Continue with the brass to the buttons and the shako plates. I then paint the straps on the knapsacks and the shako pompoms. I then used a very thinned black wash to shadow in the crevasses and to delineate the straps on the front of the figure, I also use it to delineate the equipment. I then put a very thinned second coat of Shadow Grey on the coat and if the relief is not good, I will dry-brush on an highlight of GW Ice Blue. The final step is the wash over the white trousers and here is where I clearly need help, as I am quite unhappy how these 12 figures came out. I uses a thinned Devlan Mud and it did not work this time, it just looks a mess up close. Any suggestions using washes would be appreciated. On the table, though it does give a nice campaign look...c'est la vie! It took 7-8 hours to paint these 12 figures. Perhaps you'd prefer the look of block-coated figures followed by a wash. Washing over white seems to leave the miniatures washed-out (no pun intented) and without strong contrast. No, I do not like block painting over black. I think my photography skills are poor as there is a fair amount of contrast in the colours, Just look at the knapsacks and flesh. I just can not get the white right on a regular basis. I think your mini looks very good. I am using similar technique to paint my. There are few differences however that you may consider. 1. I usually apply GW black wash as the next step after white-coat. Many benefits -> you can send them right to fight this way (looks very good), all details are well defined for painting, all white parts already washed out - so just need a little highlights/repair after. 2. Instead of GW washes I use old GW inks to paint over white coat - create much "color intense" base on my view. Sometimes I mixed ink with black ink to create darker shadow of the base color. I like GW old ink (mixing them with liquid soap), but they discontinue to manufacture them - so I am experimenting now with different brands. I notice that GW black was does work well with GW old inks - it's "stable" and let you apply ink over nicely preserving shaded lows. 3. After ink application - the unit is ready to fight (almost). Now I do highlights with GW paints over ink. I use just one color or more if I feel like painting. I had a good look at your photos, and I really like that naturalistic style. I have used a light black wash to start over white to delineate the figure. I am actually pretty sure I still have a lot of GW inks, how much do you dilute the black ink? I am confused, are you saying that you mix GW black wash with black ink. The main problem I have is decreasing the surface tension of the black washes over whites so it just runs into the recesses. Maybe I should use a different shade then black over white? With black was I run into the same problem - after I wash with GW black was - my white is not quite white anymore :( I try to dilute wash - not good - it lost some quality (hard to describe). I try to use different color of the GW wash - do not like results (it actually add a bit of pigment to the white). So I end up dry brush with white after applying the black wash and then paint highs with diluted white. Thanks Oleg, I will certainly try some of your techniques. JAM: Thanks for taking the time to post such a detailed walk-through of your painting methods. I've picked up a few tips and will try washing my primed figures first. I have been using a block method followed by a dip or wash with good results but not up to your level. Your results may actually get to try and repaint my Victrix french once I finish the Foundry and Perry figures I have in the inventory. The more I use the GW washes, the more I like them. Back to my unit of Chasseurs! Thanks Miles, I think the GW washes are great.